Been there, done that. : Oh how I miss you! 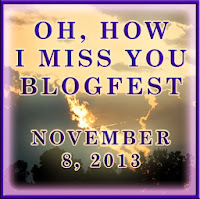 Oh, how I miss you blogfest is hosted by Andrew Leon, Alex J. Cavanaugh, and Matthew MacNish make sure to stop by their blogs and say hello! This blogfest is all about the bloggers we really miss…and the ones we would really miss! Do you have a couple blogger buddies who aren’t posting as often? Those who’ve pulled back and seem absent from the blogging world? Do you have blogger buddies you are grateful they are still around and would miss if they vanished? Now is your chance to show your appreciation and spotlight them! Just list one to three bloggers you really miss and one to three bloggers you would miss if they stopped blogging. Then go leave a comment on those blogs. Melynda Fluery had a blog called Crazy World. Her world was crazy, chaotic, fun and full of humor. She was one of my first blogging friends and my first critique partner. Unfortunatley after she lost her eyesight, the struggle of maintaining a blog became too much for her and she had to stop. Melynda, if you happen to trip over this post, I MISS YOU! It goes without saying that everyone would miss Alex if he stopped blogging. There are two special men that I would miss terribly if they stopped. One is my cyber brother Michael Di Gesu and the other is my spirit brother Roland Yeomans. I hope neither of you ever stop blogging, but if you do, I know you will be my friend forever no matter what. If you haven't already checked out these incredibly talented writers you will find them IN TIME and WRITING IN THE CROSSHAIRS! So who would you miss? Hope everyone has a fantastic week-end! Michael and Roland are both amazing writers. And super people. I would miss them both as well. Hope Michael is having a good time on his vacation. Roland and Michael are both great! I would miss them too. I agree - Michael and Roland are amazing writers! I know someone else who has had blogging issues due to eyesight. It's a sad thing. Losing your sight... valid reason to kick the blogging to the curb. I can't imagine.